That Dharath - that earth, that ground is suhaavee - is beautiful, safal - is glorious, decorated, adorned is that thaan. Pooran bheae kaam - Guru Sahibjee says that earth is beautiful where gurmukh piaarey meditate upon Waheguru. 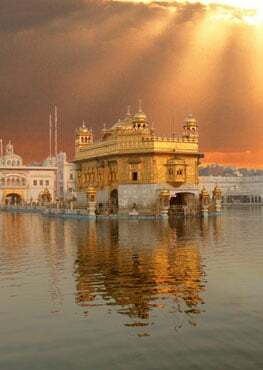 That place in which they meditate upon Waheguru is blessed and pooran bheae kaam - all of their worldly affairs and spiritual matters are resolved by the Guru, by Waheguru. God blesses them in this world and the next. Eh lok sukhiae parlok suhailey - this world goes in happiness and the next world goes in happiness as well. Guru piaareo Guru sahibjee is saying dharath suhaavee - that body is suhaavee - is beautified who meditates upon Waheguru. Safal thaan - that place, that spiritual body, the soul, the physical and the spiritual body they are beautified. Those who meditate upon Waheguru their faces have a glow. Just like anger shows up on your face, just like sadness shows up on your face so does inner peace - it shows upon your face. They have a shine, they have a glow - those people who are connected to the Guru. Pooran bheae kaam - all of their affairs in this world and the next are resolved, they are blessed, everything that they do has that touch of Waheguru, has that touch of the Lord. Bho naathaa - all of their fears are gone. What is the greatest fear in this earth - death. They do not need to fear death, they've become one with the Lord. Bhram mitt gaeiaa - all of their doubts and all of their inner doubts - bhram - what does it mean? - all of these doubts that there is anything other than God, all of that has been removed, the greatest doubt of all. How does this happen? Raviaa nith naam - because they've meditated upon raam, nith - day after day, not once or twice but day after day, raam - they've meditated upon raam, upon Waheguru, upon Hari, upon the Lord God and that is how they reach the state of being. Those people who basath - who remain, who dwell within, who meet regularly with the saadh janaa - with those humble jans who are trying to control their mind. Those people who are trying to control their mind, who are practicing sadhnaa, who are practicing meditation, who are practicing controlling their inner desires sit with those gurmukh piaarey, with those beloved Gursikhs. Sukh sehaj bisraam - what will you get? Sukh - peace in this world and the next, sehaj - balance and poise in this world and the next, bisraam - your mind will finally find a place of rest. That gharree - that moment is sulakhanee - is blessed in which simarath har naam - we meditate upon Hari, upon Waheguru. So gurujee says in these two lines that sit with the saadhus - sit with the saints and what are you going to do when you sit with the saints? - meditate upon Waheguru. Rehaao - gurujee says pause and think about this. all of these Gurmukh piaarey, all of these blessed mahapurakhs are known throughout the world. Bhagat Kabeer jee's name is known throughout the world, beyond the Sikh faith amongst the whole world. Bhagat Ravidhaas jee's name is known everywhere, Bhagat Dhanna jee's name, Bhagat Sadnaa jee's name is known throughout the world. Why? - Because they meditated upon Waheguru, they've been blessed. Their name has been elevated across the whole world because they've meditated upon Waheguru. Sathiguru Arjan Sahibjee says I go into the protection of that Waheguru who ghatt ghatt sabh jaan - who knows what is happening in each and everyone's heart. I have entered the protection of that Lord who knows the inner thoughts of every being.